It took me about five minutes to fall in love. Well, I was already in love with the basic car; the 911 is one of my dream rides, so every time I get a chance for some seat time I run out to buy a fresh drool bucket. I've driven the coupe and the cabriolet (convertible) and prefer the coupe because I hate the sun beating down on my head mercilessly on hot summer days and I don't appreciate the loss of outward view you get with a raised convertible top. Then there's the clear fact that, in my never humble opinion, most raised convertible tops ruin the look the car – and on the 911, it imparts an unfortunate hunchback look. A sunroof opens and closes more quickly and easily than a convertible top and can be opened or closed at speed, unlike a rag top (which would probably land in the next county if you tried it at anything approaching highway speeds). 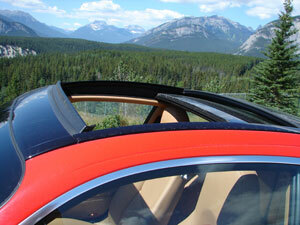 And convertibles are generally not quite as stiff as hardtops. But Porsche has split the difference here, and in a wonderful way. The 911 Targa 4S I drove for a week just may be my ultimate car (at least until Messrs Aston and Martin start giving me seat time!). I didn't care for the Guards Red color (which shines with such a beautiful glow that it would undoubtedly be a cop magnet), nor the two tone nature the smoky glass roof creates. So maybe someone will give me a black Targa 4S? The Targa roof does affect the car's appearance from the outside, which is a shame considering how gorgeous this car is in its hard top version. But a casual viewer may not even notice the Targa's slight flatness of roof arc or the aluminum trim that runs from the bottom of the A pillar right to the rear fender. Besides, the benefits you gain inside the car more than make up for it – and that, after all, is where you'll spend most of your quality time with the Porsche. Inside, you can look up at a massive, virtually completely glass roof that even when closed gives you a panoramic (though colored) view of the world outside. It's particularly effective when you're driving through mountains, but it's great everywhere. And that's only the beginning. Press the little console-mounted button and this huge glass panel slides backwards to open up a hole large enough to make an ejection seat practical (maybe it'll be an option on the '08 model). It's glorious. Unless it's a really hot day and you don't like the sun beating down on you, which happens to a certain extent even with the big glass roof closed. But Porsche has thought of that, too, bless their Teutonic hearts: a power retractable mesh blind rests just below the roof, and it can keep you from frying your brain when the roof's closed, as well as giving the interior a tad more privacy when surrounded by the inevitable rubberneckers. It's an elegant system. Barely touch the button and the net retracts from the roof in a single motion; press it fully and the whole roof slides open or closed. Unlike the blind, the roof doesn't open or close with a single touch: you have to hold the button down until the roof gets to the point where you want it. This isn't a big deal, though. It's best to open the roof all the way, because the trailing edge of its frame blocks a portion of your view rearwards from the inside mirror and if you only retract the roof part way it blocks virtually all your vision from that mirror. Fortunately, you still have two outside mirrors to help take up the visual slack – and, the car's so low slung anyway that even with the fully-opened roof blocking part of your view you can still see most of what's behind you from the inside mirror anyway (except possibly for toddlers or Miatas); it's just a little more challenging. The extra layer of glass you get when the roof and rear window are together makes the view a lot darker than normal, which could make it difficult to notice those flashing lights behind you – but it sure beats the alternative of not having that great roof! Porsche says the roof and sunshade combination also offer "excellent UV protection as well as added insulation in winter." My only quibble is that I wish you could retract the roof without retracting the mesh net sunshade, as you can in the Mini Cooper. That way you could get the fresh air of open top motoring without that darn sun beating down on you. That said, the Targa has excellent automatic air conditioning with about a zillion fan speed settings, and that helped me survive the oppressively hot summer week of my test period, when I had to wuss out periodically and close the roof lest my brain become any more fried than it is normally. Naturally, when you retract the roof a wind blocker raises at the leading edge of the cavernous opening in the roof. Despite it, you still need to shout (or crank the excellent stereo) when speeds reach highway levels, but it seems quieter than the regular sunroofs I've tried in other 911's. 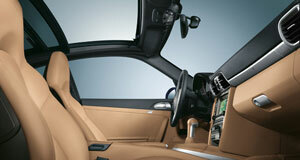 And here's a wrinkle I didn't expect: the Targa is also hatchback, something you won't see on other 911 models. You can release the rear window and raise the glass quite high to facilitate putting stuff into the "back seat" area that's really only suitable as a storage compartment anyway. It isn't as easy to load or unload stuff from the hatch area as it is with the Cayman, because the Targa's rear engine makes it a much longer reach, but it's better than not having the hatch! It came in handy when we found ourselves at some garden curio maker's out in the boonies and my lovely wife decided a we couldn't live without a decorative sun thing in our garden. It wasn't heavy, but it was too big for the Targa's main trunk up front and the convenience of the hatch was welcome. Other than the roof and rear window histrionics, the Targa 4S is pretty well a Carrera 4S, and that means it's a fabulous drive, fast, sticky and hedonistic without forgetting that it's first and foremost a sports car. I won't spend a lot of time on the rest of the car, lest this turn into my second novel, but rest assured this beastie's about as state-of-the-art as you could want or need. The 911 4S is powered by Porsche's 3.8 liter six cylinder "flat six" engine that seems puppy-eager to fire 355 horses and 295 lb. ft. of torque to all four wheels (the "4" designation in "4S") through a slick six speed stick or a Tiptronic automatic that's one of the best (except for the mounting of its "non-paddle shifters" on the front of the steering wheel). I was pleased to note my tester was equipped with the stick, and its shifts are short, smooth and satisfying. The steering is typical Porsche, which means the thing goes where you point it with little more than a thought and a slight twist of the tilt/telescoping three spoke steering wheel. My tester's gloriously comfortable and supportive seats also featured optional power adjustment with memory and bun warmers. You can drive all day in them and be ready for more. The seats fit my back better than the upmarket sports seats that were in the 911 Turbo I tested recently. Standard on the Targa 4S is Porsche's Active Suspension Management (PASM) system and Porsche Stability Management (PSM) with ABS and a bunch of other acronyms. 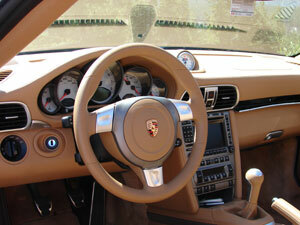 PASM features a "sport" setting that tightens up the car, hunkering it down for business; it changes the car's feel from "merely" catlike to Cheetah-like. Other options in my tester included a Sand Beige full leather interior that adds a few grand to the sticker, but which looks fabulous, Sport Chrono Plus (Analog and digital chronometer, ability to adjust lighting, wipers, AC and door locking, and more) and a nifty self dimming mirror system (though on a particularly bright afternoon they'd darken and lighten again obtrusively, it seemed almost randomly, and when they were dark it was very difficult to see anything in them with my polarized sunglasses on). I might skip that option and keep stuff like the upgraded stereo instead. 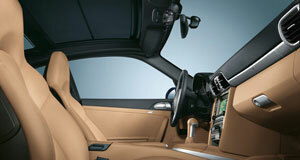 And that optional Bose stereo is first rate, with rich, deep and rumbling bass and transparent highs. It sounded great with my reference CD's. 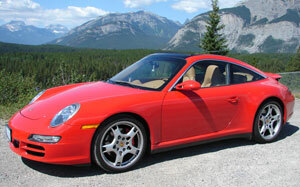 The Porsche Targa 4S starts at $95,900 U.S.($133,200 Canadian). With my tester's list of options the price comes closer to $110,000 U.S. ($150,000 Canadian). The worst thing about reviewing any Porsche is that you have to give it back afterwards. It was more difficult this time than ever.